Vidigal favela is just a cascading huddle of breezeblock and corrugated-iron shanties overlooking the ritzy stretch of beach that is Ipanema and (chicer still) Leblon. This is potentially the most attractive real estate in all of Rio de Janeiro. It was pacified by police special forces in December. 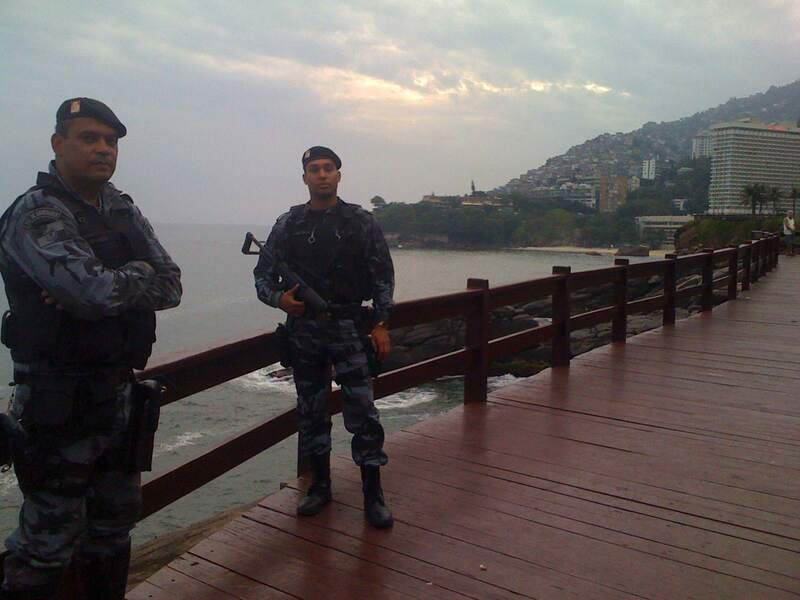 The roadblocks, snipers, smoke and helicopter gunships were hard to miss, even from Ipanema. I was back in Vidigal the other day and on the face of it, little seems to have changed. There’s a heavier police presence and fewer 13-year-old crack-heads openly carrying pistols, but locals say the trafficking is going on as it ever did – it’s just hidden deeper in the rabbit warren of alleyways. Because of the police patrols, scores that need to be settled now are more often done so silently with knives or machetes than with guns. Yesterday I visited friends deep in the heart of Rocinha, South America’s biggest and (according to many melodramatic press reports) most dangerous favela. Heavily armed special forces patrols move up and down the street, making Rua 1 look like a sunny version of old Belfast. Up on the slopes, ramshackle hovels still slouch against each other like drunks at a bar, but prices of even the ricketiest shack in Rocinha have sky-rocketed. Word has it that two thirds of Vidigal have already been bought up. Nobody really knows who all the buyers are and there are rumours that they might be working for one of the big hotel chains. It has always been on the cards that when Vidigal was finally pacified it would eventually end up as luxury villas or condos. Most people didn’t expect that to happen for a decade or two. But there is a race on to find accommodation for the World Cup (2014) and Olympics (2016) and it seems that these huge changes might be just around the corner. The people of the favelas traditionally call themselves “os do morro” – those of the hill – because, in most cases, these ghettos were built on inaccessible hills that were shunned by the rich people. Now the tables are turning – they are turning so fast that heads are spinning. The rich have finally laid claim to the hills. Want to read more about Rio? Don’t miss: 10 incredible South American experiences; photographs from the Rio Carnival; and a road trip around Brazil.